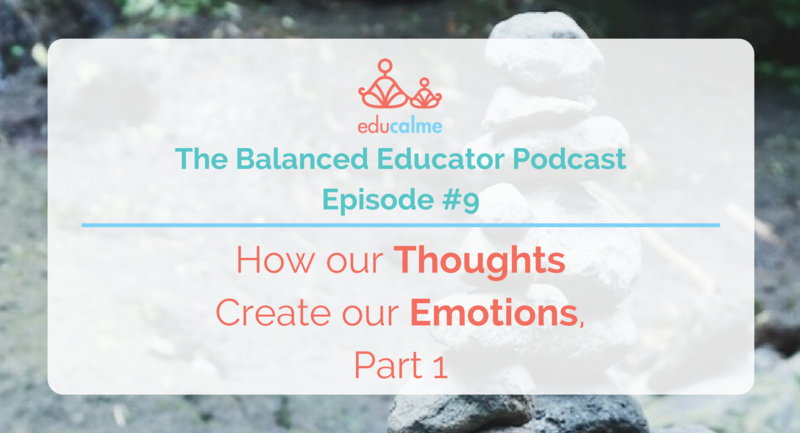 In today’s episode of The Balanced Educator Podcast, we’re explaining one of the most empowering things we’ve learned – how our thoughts create our emotions. We talk about how it isn’t the situations we encounter that create our emotions, it’s actually our perception and our thoughts about the situation that create the emotions we feel. It’s our thoughts that create our emotions. We’ve made a infographic for you in The Balanced Educator Free Resources Library to help you understand this concept at a deeper level – and because sometimes we need a visual (hello to all our visual learners out there!). We talk about mindset shifts that we’ve used to move out of feeling negative into feeling more positive, simply by changing our thinking. This episode is perfect for you if you want to learn how to manage your thoughts to create awesome emotions in your body! If you want to see what we’re up to between now and next week’s episode, you can connect with us on Instagram @educalme. If you enjoy the show, we would really appreciate if you write us a review on iTunes! Reviews help people like you that are looking for the content we share to find The Balanced Educator Podcast.